Building work on the pub is well underway. Richard Jackson of Yorkshire Ventures confirms that the pub will have 9 letting rooms and they have made a huge investment in seeing it finished and being a success. 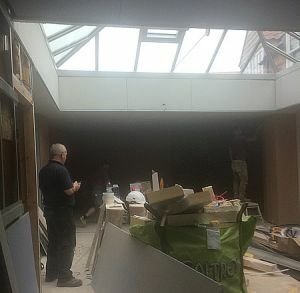 Talking to Steve Charlton (Construction Manager) on site it becomes clear that there is no scrimping on ideas or materials. The letting rooms are large with an en-suite wet room. There is a boardroom available for meetings and private functions will full data facilities. A large parking area at the back will lead to a rear entrance where there will be a reception desk for guests to sign in. Also at the rear there will be a large paved patio suitable for eating and drinking. The central dining area is under an atrium and alongside a long bar. Heineken are supplying and fitting the beer and cellar equipment. The beer will probably be Theakstons with a. own-branded guest beer as well as a wide range of other drinks. The area inside the front door will be a soft seated bar area where drinks and meals can be served. This will probably be similar to the White Swan at Ampleforth. Much of the interior design will be overseen by Richard Jacksons wife, Elaine, who has sound experience in this area. The pub will have a manager who will live in the village. Overall the project looked impressive and reflected the statement that this was a considerable investment. The kitchen alone, cost in the region of £70,000. There has been justifiable cynicism in recent history as to the future of our pub. The current owners are keen to make this a success and are optimistic it will be open on or before the 19th of December.